With the uproar of what the 3DS will or won't do to children's vision, know that 3DS title Nintendogs + Cats is more than simply an updated Nintendogs with feline friends. It's an update with eyes that can see players. 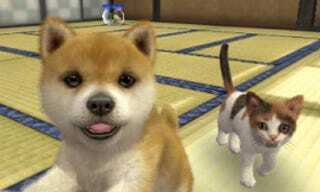 The first Nintendogs game, released in 2005, was inspired by Shigeru Miyamoto's own experiences owning a dog. The famed game designer often creates titles based on his life. But the in-game mutts weren't totally realistic. They looked somewhat "soulless", as they did not have realistic doggy eyes. The critter's peepers were drawn in. This time around, Nintendo was able to create virtual eyes for the four-legged friends thanks to the capacity of the 3DS's more powerful hardware. The eyes respond to light, flutter, squint and express the pet's emotion. Even the eyes of the in-game cats dilate and become slits — fitting as Miyamoto got a cat during the making of this game. During development, there was concern whether cats alone would make an interesting game, but Miyamoto felt that dogs and cats living together (madness!) would create a viable and enjoyable experience. The eyes of the in-game animals, however, are more than cosmetic. They can "see" players, similar to the facial recognition in the upcoming Love Plus 3DS love simulator, albeit minus the cockblocking. The 3DS's camera recognizes players, and over time, so do the Nintendogs and Nintencats. Eventually, players won't even have to call their pets, because their pets will remember their masters. And as most pet owners can attest, their own pets are always the cutest, which is why Nintendogs + Cats has a photo function that enables players to take 3D snaps of their virtual animal. It's even possible to put the critters in real locations with the handheld's AR cards. All that's missing is the smell of the litter box.